The Rev. Mark S. Hanson (2nd from right), ELCA presiding bishop and LWF president, and the Rev. Rafael Malpica-Padilla (left), executive director, ELCA Global Mission, were welcomed June 30 at the Medan airport. The Rev. 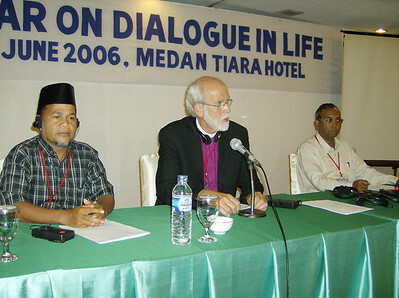 Mark S. Hanson, ELCA presiding bishop and LWF president, was flanked June 30 by Muslim (left) and Christian chairs of the LWF Seminar on Dialogue in Life, Tiara Hotel, Medan, Indonesia. 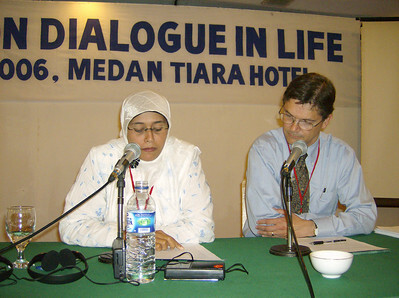 Syarifah Rahmah (left) and the Rev. Mark N. Swanson read a draft statement members of the dialogue issued June 30. Rahmah was a Muslim member of the dialogue from Aceh, Indonesia. Swanson, an ELCA pastor, was director of the Islamic Studies Program at Luther Seminary, St. Paul, Minn. The Rev. 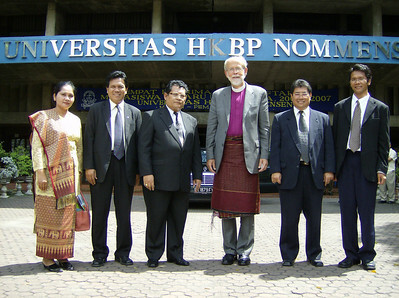 Mark S. Hanson (center), ELCA presiding bishop and LWF president, addressed an audience of more than 300 July 1 at the HKBP's Nommensen University, Medan, Indonesia. The Rev. 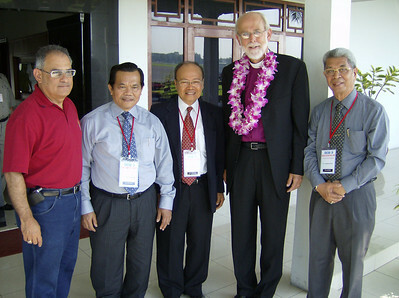 Deonal Sinaga (left), director, HKBP Office for Ecumenism, Tarutung, Indonesia, translated Hanson's words into Bahasa Indonesia. The Rev. Mark S. Hanson (3rd from right), ELCA presiding bishop and LWF president, was welcomed July 1 with traditional garb by officials of the HKBP's Nommensen University, Medan, Indonesia. 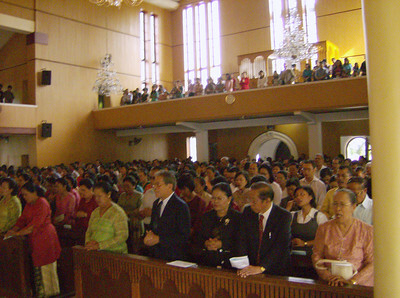 The HKBP Sudirman is the largest Lutheran congregation in Medan. The 7:30 a.m. service July 2 drew hundreds to hear the Rev. Mark S. Hanson, ELCA presiding bishop and LWF president. The Rev. 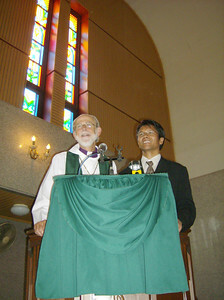 Mark S. Hanson (left), ELCA presiding bishop and LWF president, shared the pulpit of HKBP Sudirman, Medan, Indonesia, July 2. The Rev. 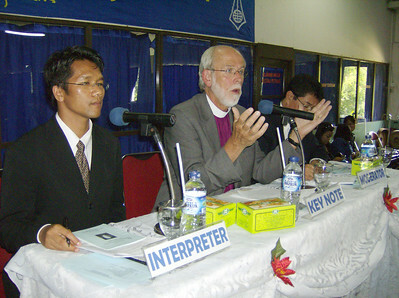 Deonal Sinaga (right), director, HKBP Office for Ecumenism, Tarutung, Indonesia, translated Hanson's words into Bahasa Indonesia.